The woods listed and described below are from my supplies left over at the time of my retirement several years ago. I will now never be able to use all of these beautiful woods. In the past I have tried very hard to accumulate a supply of wood of the highest quality to use in the Flemish and Italian instruments that I have built. The woods listed below are therefore all to be considered as special and out of the ordinary. Some, like the cypress, are now protected species and therefore available only in small quantities if at all. Indeed, it seems to be illegal to import cypress into the United States. Others like the spruce, for example, is no longer available in flitches. Making a soundboard from a single flitch results in a soundboard made from wood all from the same tree and from successive slices of the flitch so that it is of uniform colour, grain and texture. If you are unable to choose planks all from the same tree, it is otherwise very difficult to obtain this uniformity of colour and grain. The cypress has a long straight grain and is, unless stated otherwise, sold as entirely knot free!! [Have you ever seen a cypress tree with no branches??]. These woods were purchased by me many years ago (mostly in the early seventies) and so they are all now 40-45 years old or more. During the time that I have had them they have all been stored indoors in a cool dry environment. They were all originally air dried and so are therefore now completely stable and not subject to twisting or warping. Although listed here as harpsichord-making woods, many of these would be useful for making spinets, virginals, clavichords, forte-pianos, dulcimers lutes and guitars. We would consider machining any of these woods (sawing and planing/thicknessing) to your requirements in order to reduce the weight of your shipment. This extra work would would be charged for at a nominal pro-diem rate. Most of these woods are not now available of the age and quality of these planks. I have VERY mixed feelings about disposing of them!! A spectacular off-cut from one of the flitches! This is one single plank showing clearly the variation in growth rate through the years, and almost perfectly quartered from one edge of the plank to the other. This excellent soundboard wood originated from the Italian Dolomites – near Cavalese not far from Bolzano (Bozen) in Trentino. It comes from the historic Val di Fiemme where the famous Cremonese violin makers (like Amati, Guarneri and Stradivarius) obtained the wood in historical times for their violin tops. This is the same wood as the famous abete maschio so treasured and beloved by violin makers everywhere. The Val di Fiemme is still the source of the violin tops of the best violin makers from Cremona, Venice, Brescia and throughout Italy and the rest of the world. A particularly big log of clean, slow-grown European spruce from the Val di Fiemme in Trentino in the Dolomite area of Northern Italy. Like the wood used in the Cremonese stringed instruments, it is accurately quartered, slow grown and mostly fine grained. It is sold only in single flitches (see below), with most flitches consisting of thin planks cut from one sixteenth of a trunk sawn radially. 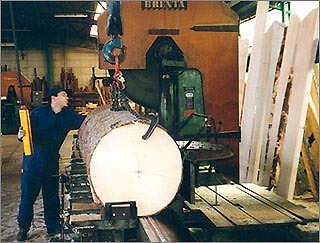 Cutting a quarter-log into eighths. Each eighth was again cut in half into a sixteenth, and these were then sawn, under my instructions according to the grain of the individual sixteenths, into 5-7mm thick planks as indicated below. Each sixteenth was sliced into planks (see below) about 5-7mm thick in such a way that each plank was very well quartered. Where possible the sixteenths were sliced as centred (see below) flitches, but often more accurately-quartered thin planks resulted by slicing the sixteenth from one side or the other depending upon how the tree had grown. Inevitably, some of the narrower planks are less well quartered, but these are still perfectly usable for wrestplank veneer, for example. However, when I originally purchased the wood, I was able to choose from a vast selection of sixteenth sections, so I chose those that yielded the maximum amount of quartered wood. The tree trunk is practically always slightly distorted and not like the diagram below, so a judicious choice of sixteenth sections cut either from one side or the other (or centred) gave planks after sawing that were almost all accurately quartered and usable as soundboard wood. I sell this wood only in whole flitches - the amount of wood in each flitch is variable. Some flitches are very large and capable of making many soundboards; others are small with enough wood to make soundboards for only a few instruments. Some flitches could only be used for clavichord, guitar or lute soundboards because of the small number of full-length boards in the flitch. Because each flitch comes from the same tree and even the same part of the tree, all of the wood in a soundboard made from a single flitch is the same grain, colour and texture and so makes a beautiful-looking, as well as a beautiful-sounding soundboard. This soundboard wood was bought in 1976 when it was already about 5 years old. So it is therefore now over 45 years old. It was air dried (definitely NOT artificially kiln dried using steam), and has been stored in a cool, dry storage area ever since then. The Italian merchant from whom I bought the wood in 1976 told me recently that such fine soundboard wood has never since passed through his warehouse! Nonetheless it comes from real spruce trees which can, of course, have defects. So some flitches have a number of the usual pitch pockets characteristic of European spruce, and some have knots from branches. There is also some water staining in some flitches that must have happened just after felling which I could not detect when I selected the sixteenths for cutting into planks. I have tried to indicate when flitches have defects such as these, and have often included only the clean usable wood in the calculation of the usable length of the flitch and the width of the planks in order to calculate the area. All of the spruce being offered here would work very well in harpsichords, virginals, spinets, clavichords, lutes, guitars, dulcimers, and any instrument needing a softwood soundboard wood. It is all very straight-grained, even-grown and very well quartered. The flitches ensure that all of the wood in a soundboard is from the same tree and matches in colour, growth rings and texture. Knot free and 40 plus years old! This wood originated from just outside of Florence in central Tuscany. Unlike virtually all cypress wood which is commercially available, this wood is sold TOTALLY KNOT FREE!! (Cypress does have knots, and if there are knots in any of the planks for sale here, it is not included in the calculation of the area or volume of the wood.) It was bought in 1981 and it had then already been air seasoned in Italy for about 10 years. So it is now well over 40 years old. It is mostly available in thin planks about 5½ to 6½ mm thick, but thicker solid pieces about 25 mm thick are available and sold according to volume in whatever lengths (up to 3.9 metres) you choose. Because of its age, this cypress has already started to acquire the warm brownish appearance of age. With the addition of a coat or two of dilute boiled linseed oil it soon takes on the appearance of a seventeenth- or eighteenth-century Italian harpsichord or virginal. The case and soundboard cypress is generally sold in complete flitches with planks each 5½ to 6½ mm thick. The total cost of a flitch will be calculated individually per plank depending on the amount of usable wood in each plank so that the cost reflects that of wood which is suitable for case sides (plank sawn) or soundboard material (quarter sawn). These planks in each flitch are sold as successive cuts from the same log and these obviously have matching grain, colour and texture. First quality cypress in thick planks 3 to 3.9 metres long and 25 mm thick. This is sold per cubic metre. None of the thick cypress planks listed on the cypress price page below will be sold as a single plank. Instead the thick planks will be sold in units that are about 1 to 1½ metres in length, depending on your requirements. This is fine quality genuine African ebony (not African blackwood) suitable for black-natural touchplates, sharps, inlay, stringing, etc. It is sold in planks about 27mm thick, 11 to 15 cm wide, and whatever length you choose up to 1.5 metres long. This ebony is sold per kilogramme. 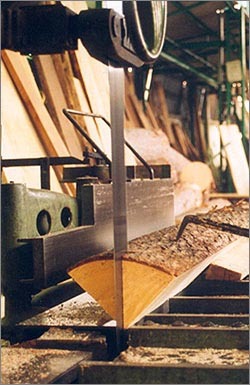 This wood has occasional light-coloured streaks (this is normal in diospyros crassiflora) in the sawn form, but these disappear when the wood is polished. These would make a suitable stool to go with a Flemish-style fumed oak stand (see Drawings 7, Drawing 8 and Drawing 9 available for sale from this site). What!!! You got more wood than you ordered and you didn't even pay for it?? If you get more wood than you ordered, please do not complain. Such complaints will not be entertained!! You will, on the other hand, unfortunately have to pay for the shipment of any excess wood! Please understand that I am trying to empty my workshop of this beautiful stuff! !